We support job creation and buy goods and services from local suppliers that meet our standards. This is one way for us to share the benefits of oil and gas development with the wider economy. We also offer our support to governments when they are designing legislative frameworks to promote local economic growth. To ensure we comply with legislation and contribute to people’s standard of living, our supplier principles integrate social considerations in the contracting and procurement processes. In 2018, we spent $42.7 billion on goods and services worldwide, of which around 61% was in the USA, Canada, the UK, the Netherlands and Australia. In 2018, we estimate around $4.1 billion was spent in countries that, according to the UN Development Programme Human Development Index 2017, have a gross domestic product of less than $15,000 a year per person. In these countries, Shell companies spent 80%, or around $3.3 billion, with local companies. 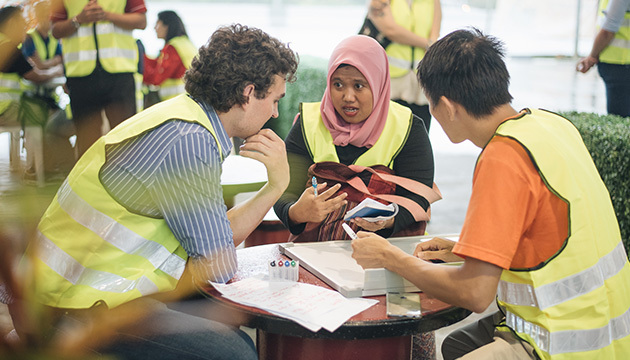 In Malaysia, Sarawak Shell Berhad collaborated with the Sarawak State Oil and Gas Unit to identify 400 East Malaysian vendors offering services including drilling, inspection and maintenance. We shortlisted 30 companies and some have already been invited to participate in our ongoing tendering process. 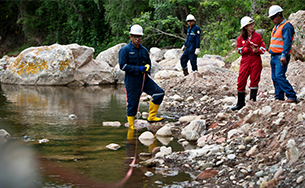 In Trinidad and Tobago, four local contractors from the transport, catering, maintenance and facilities management sectors provide services to Shell Trinidad and Tobago Limited. In 2018, an event we hosted to encourage more companies to join our supply chain was attended by 31 contractors, of which 10 were local suppliers. 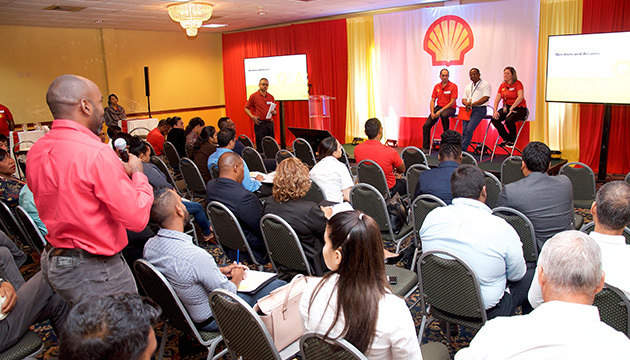 At an event in Trinidad and Tobago we encouraged local suppliers to join our supply chain. In 2018, Shell Philippines Exploration B.V. and its contractor Helicopters New Zealand launched an initiative to increase the number of Filipinos in technical positions as part of efforts to transfer specialist skills to Filipinos and promote local talent in the energy industry. Of the 22 technical roles that were previously filled by expatriates, 10 are now filled by Filipinos – four aircraft engineers and six pilots. Shell LiveWIRE marked its 36th anniversary in 2018 and operates in 18 countries and 10 languages. In 2018, we launched new programmes in Trinidad and Tobago, France, Kazakhstan and China. We trained 2,686 people and supported 1,463 businesses, while 1,374 jobs were created. In addition, 43 businesses entered the Shell supply chain. The Shell LiveWIRE programme helps local entrepreneurs turn their ideas into reality. In 2018, three entrepreneurs from the UK, Malaysia and Indonesia received the top prizes in the 2018 Shell LiveWIRE Top Ten Innovators Awards, a global competition which highlights and rewards entrepreneurs that demonstrate excellence in innovation. Shell LiveWIRE entrepreneurs increasingly focus on energy solutions, such as affordable and cleaner energy for low-income communities. 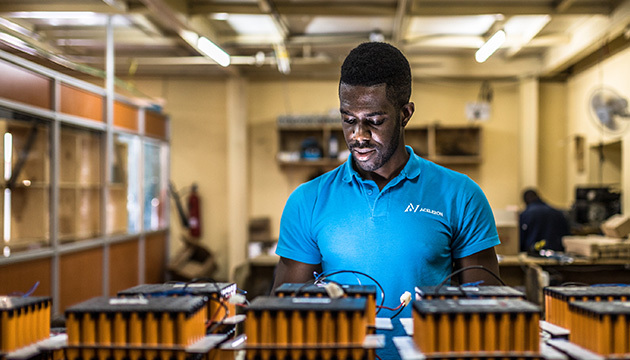 For example, Aceleron from the UK recycles waste batteries into low-cost energy storage and launched pilots in the Caribbean and Africa in 2018. Alternate Energy from Nigeria provides solar and wind powered community solutions. 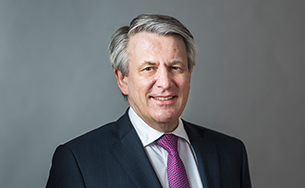 Carlton Cummins, co-founder of Aceleron, is pioneering low-cost energy storage from waste lithium batteries. 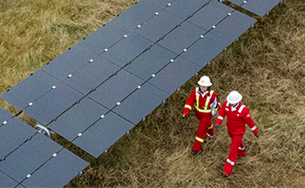 The winner of this year’s Shell LiveWIRE Top Ten Innovators award for energy solutions was Metronome Energy from the UK. Metronome Energy has developed low-cost technology to balance demands on the national power grid during peak times by managing when electricity is delivered to farming equipment. Read more about Shell LiveWIRE winners at www.shell.com/shell-livewire.